Candidates seeking office in Alameda County are invited to seek the endorsement of the East Bay Stonewall Democratic Club. To our friends running for office in Contra Costa County, please contact Lambda Democrats of Contra Costa County to inquire about their endorsement process. There are two endorsement interview opportunities for LGBTQ+ candidates in Alameda County. The Club will consider LGBTQ+ incumbents at the August 15th membership and early endorsement meeting. All other candidates, regardless of sexual orientation, will be considered for endorsement on September 13th. Please note that any person wishing to cast a vote in the endorsement process must have been a member of the club for 7 days before the vote occurs. People interested in joining the Stonewall Democratic club can register here. Once a candidate has completed the below information, the PAC Chair will send the candidate an endorsement questionnaire, along with more detailed information about the endorsement process. The application must be completed by the deadline specified in the email in order for a candidate to be considered for endorsement. 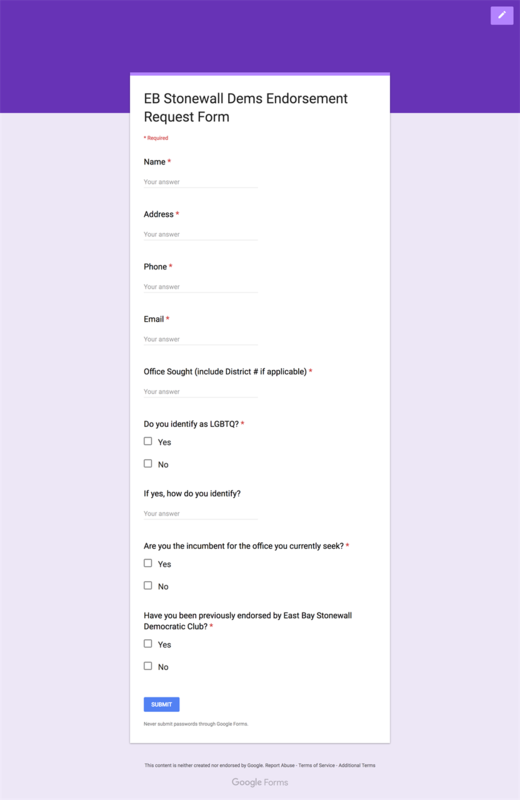 Completing the form does not qualify you for endorsement if you have not also completed the subsequent questionnaire.